We had the pleasure to work and partner with IMD to help a large international pharmaceutical company (worth > $45 billion yearly revenue) to better understand why executive leaders would leave the company. This was very important to the company because it takes significant amount of resources to recruit, train and retain executive leadership, and it can be very disruptive. Initially it was believed that executive leadership development programs may be contributing to executive leaders leaving, but we found that not to be the case. 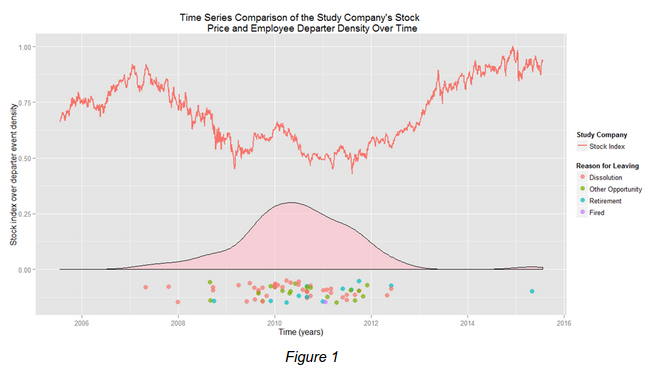 We were able to use our unique approach of combining statistics, software engineering and data visualization to better understand why executive leaders may be really leaving the company. What we found was that as economic factors increased in severity, the number of events of employees leaving the company also increased. In other words, there was strong evidence that the pressures inciting such restriction was most likely due to the global economic recession, which occurred directly in the middle of the study period (see Figure 1 below). We could also visualize the manner in which executive leaders left the company and why they left the company. In Figure 2 and Figure 3, the horizontal lines can be interpreted as when each participant entered the study and when each participant left the study or the study ended. Considering Figure 2 more closely, we could see the staircase/staggered way in which individuals entered the study and left the study at different times. Further, very few participants left the study pre-recession, but when the Dow reached its lowest point (07/2009 to US Lowest Dow Index) the rate of individuals leaving increased significantly until the end of the study. 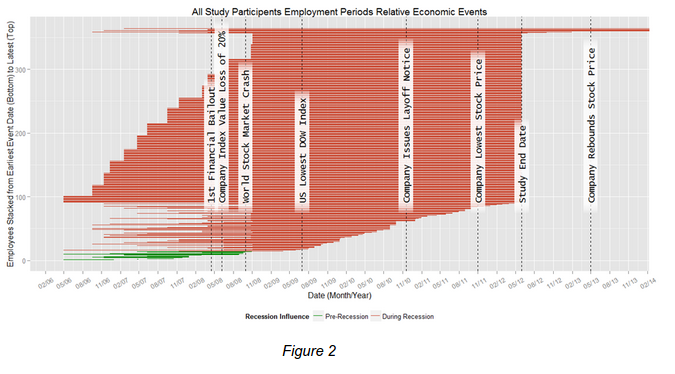 Figure 2 gives a more detailed depiction of each participant in the study, and what effects various macroeconomic events may have had on participants exiting the study. 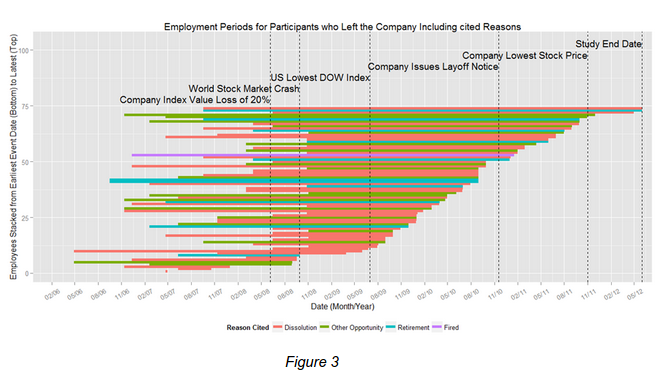 Figure 3 offers a nice snapshot of just the individuals who left the company before the study end date and why they left the study. As is clearly illustrated, there is a fairly significant increase in dissolutions near the start of the stock market crash that continues on to the end of the study. We were also able to model and succinctly summarize whether or not other factors may or may not contribute to executive leadership attrition (see Figure 4). As can be seen, executive leadership (coaching in the table) and job level did not show a significant model effect. Thus, the results suggested that whether or not an executive receives external coaching as part of their development training program, the coaching does not seem to have a visible relationship with regards to the odds of an employee departing the company. Lastly, we looked at some other factors that may be contributing to why employees are leaving (see Figure 5). 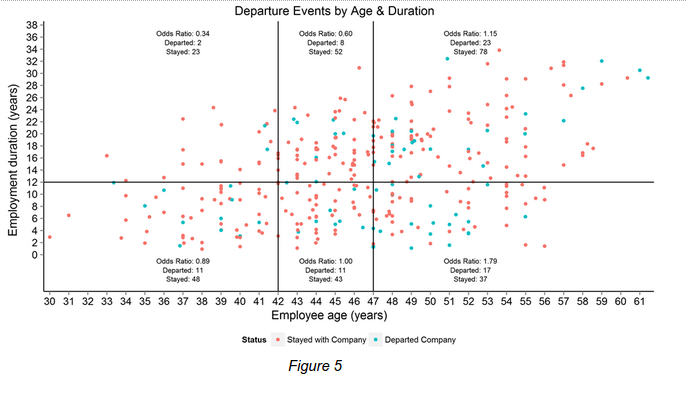 This figure contains the per category participant age by employment duration scatter plot and cell ORs, which further illustrate and supports the results from Figure 5. Each cell contains the ORs as well as departure and non-departure cell frequencies. The reported cell ORs are also derived from the comparison between the cell odds divided by the base odds (as above). The overall interpretation of the findings is that participants who were older in age (i.e. age > 47 years) at the start of the study, yet had not invested as much time as other employees at the company (i.e. < 12 years) were the most likely to depart during times of financial hardship (OR = 1.79). In other words, they likely started older, had less seniority, were hired at a lower pay level, etc. 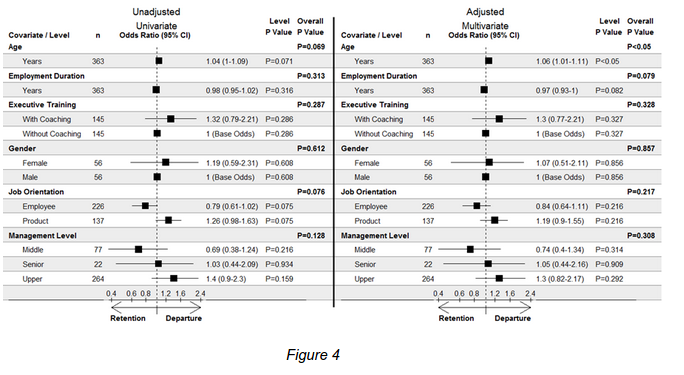 In general, the OR of employee departure seem to increase when going from the top-left (greater employment period, lesser age) to the bottom-right (lesser employment period, greater age). Thus, younger employees (i.e. age < 42 years) with the most time invested in the company (i.e. > 12 years) where the least likely to leave (OR = 0.35).